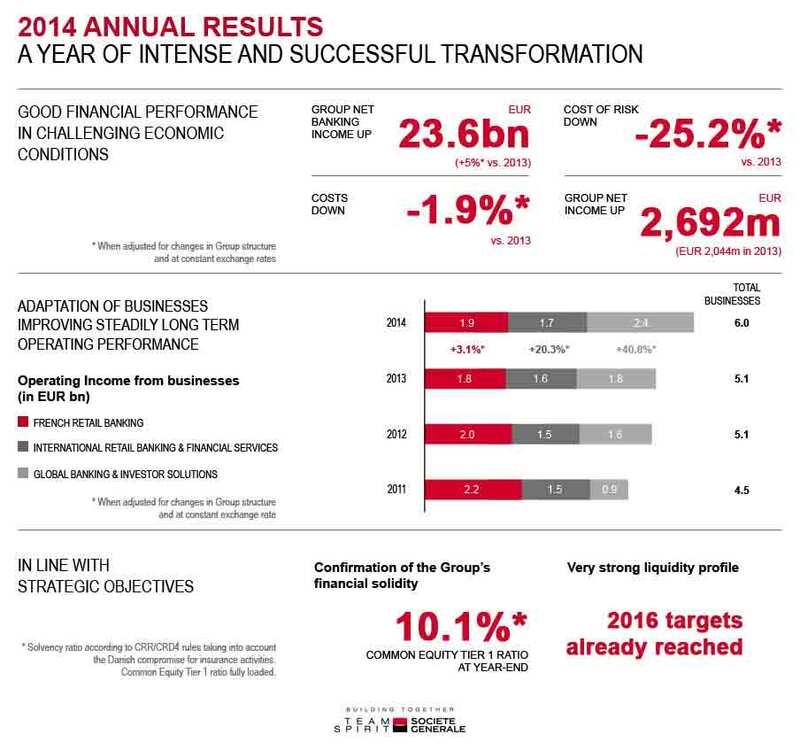 2014 was an eventful year for our Group, with the celebration of our 150 years, the presentation of our strategic plan and the introduction of the European Banking Union. 2014 was also marked by a particularly challenging geopolitical, economic and financial environment. Against this backdrop, the Group embarked on a far-reaching transformation, supported by a solid balance sheet and capital position. All the businesses demonstrated a good commercial dynamism. Chairman & CEO Frédéric Oudéa commented on the Group’s 2014 annual results in an interview he gave to EuroBusinessMedia (CEO-Direct). The drop in oil prices, coupled with accommodative monetary policies, has recently supported activity in developed countries still struggling to pick themselves up, but is problematic for some producer countries. As a mature European economy with still significant growth opportunities, Germany will have an important contribution to Societe Generale's balanced growth strategy. The Group has decided to accelerate its development in the country and is targeting a growth rate between 5% to 10% per year for its activities in the coming years. Test the Societe Generale App’s future services and features… This is now possible thanks to the "Appli LAB"! Societe Generale is enabling its customers to participate in the development of future versions of its iPhone and Android app, which is already acknowledged as being the world’s best mobile banking app. Bravo! For the second year in a row, Playing for salle Pleyel, a unique initiative in the world of business, brought together on 16, 17 and 18 November 2014, 180 singers and 60 musicians from all parts of Societe Generale to perform at this famous Parisian music venue. A winding line depicting a movement that appears to be suspended in mid-air, The Greek Knot ("Le Nœud grec" - 2014) is part of a series of works of art created by Jean-Michel Othoniel since 2008. The piece was commissioned by Societe Generale and is on display in our offices in La Défense, Paris. Subscribe and receive every quarter the electronic version of the Letter to Shareholders and all the financial and strategic news.